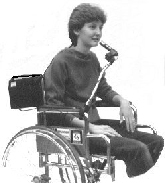 GOOSENECK SUPPORTS for the handheld microphones are often ideal for people in the same place much of the time (desk, chair, bed, etc.) and for those using wheelchairs. 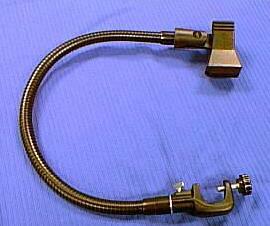 A pinch clamp allows instant mic insertion or removal. 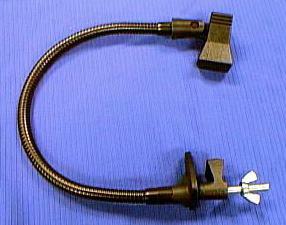 For those with reasonable head control, this set-up allows easy use of the mic, leaves the head "un-wired", free of connecting cords and mic supports. A slight turn of the head places lips near mic while speaking. A slight turn away avoids amplification of breathing, coughing, sneezing and allows eating or drinking without the mic in the way.